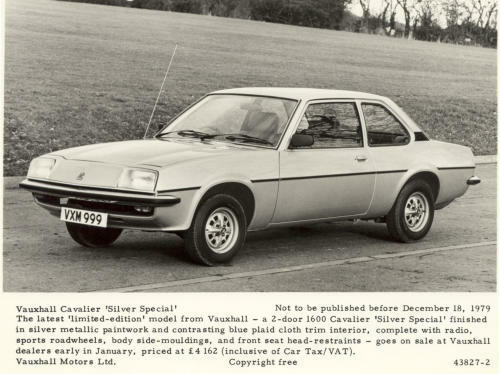 Vauxhall Cavalier Mk1 “Silver Special” The Cavalier Mk1 Silver Special was a limited edition 2-door 1.6 Cavalier Mk1 finished in Silver Metallic and had contrasting blue plaid cloth trim interior, complete with a radio, sports road wheels, body side-mouldings and front sea head-restraints. The price new was £4162. 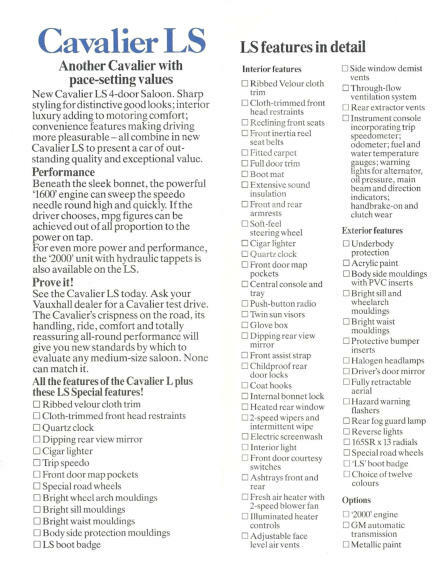 Vauxhall Cavalier Mk1 Command Performance. "The Command Performance" was a sort of Vauxhall Roadshow in 1980 and was a mixture of trying to sell cars and light entertainment with Ted Rogers of "321" fame. 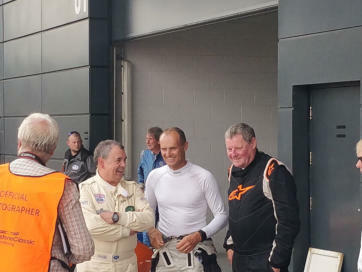 The lavish performances cost a huge amount of money, which Vauxhall didn't have at the time, and resulted in very few extra sales. 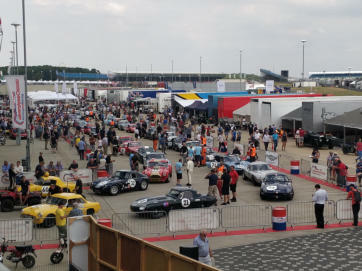 Dealers were supposed to issue invitations to prospective customers but most just took their friends & family for a freebie night out. 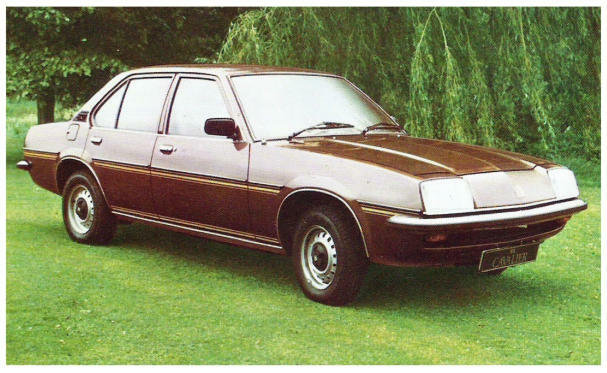 Vauxhall Cavalier Mk1 LS The last special edition was the Cavalier Mk1 LS and was only available for the last twelve months of Cavalier Mk1 production and was a mixture of L, GL and GLS trim. It was very much aimed at the Fleet Market. The Concept 2 Sportshatch in the early stages of mock up in the Design studio at Luton, the front end dimensions and doors were from the U- Car Coupe. The Command Performance Dancers who worked with Ted Rogers on The Light Entertainment Aspects of the evening. 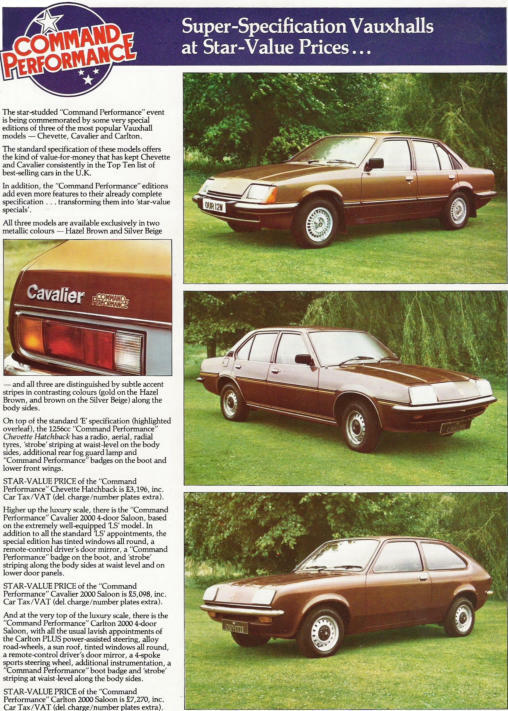 A Cavalier Mk1 Command Performance. 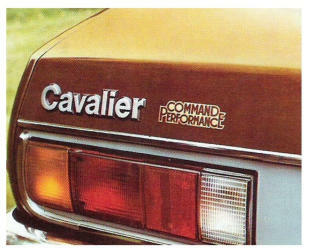 Cavalier Mk1 Command Performance badging. Above is a copy of the programme from one of the Command Performance evenings. A Vauxhall publicity photograph of one of the Command Performance venues. 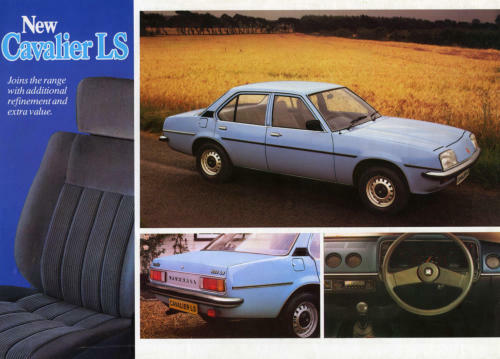 The Vauxhall Cavalier Mk1 LS Brochure.